The Democratic National Committee on Friday dropped a top New Hampshire TV station as a sponsor of its upcoming presidential debate over a labor dispute with the union representing some of the station’s employees. The pension dispute involving just around a dozen employees of WMUR, the ABC affiliate in Manchester, had roped in all three Democratic presidential candidates and the DNC, whose chairwoman has been trying to play a mediating role between the union and management ahead of next Saturday’s debate. WMUR holds unique sway for a local TV station as the only network affiliate in New Hampshire, and one of only of two TV news stations based in the state. In addition to holding the nation’s first presidential primary, New Hampshire is also a general election swing state, so the station is perennially a top source of political advertising spending. IBEW Local 1228’s threat to picket next Saturday’s debate in Manchester put the candidates and the DNC in the awkward position of having to decide between siding with the top TV station in a key state, or with organized labor, a critical constituency to the Democratic Party. 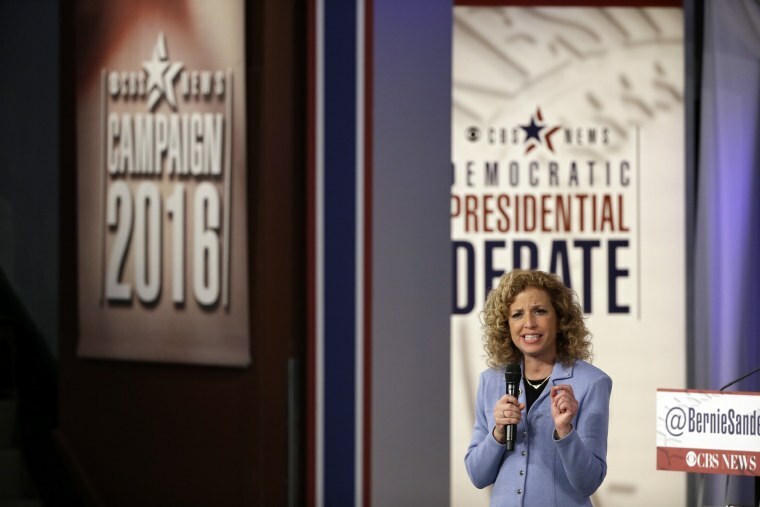 “Regrettably, as a result of WMUR’s unwillingness to move forward on scheduling negotiations between the Hearst Corporation and Production Department employees represented by IBEW Local 1228 prior to the debate, we will no longer include WMUR as a co-sponsor of the debate,” DNC Chair Debbie Wasserman Schultz and New Hampshire Democratic Party Chair Ray Buckley said in a joint statement. Hillary Clinton, Bernie Sanders and Martin O’Malley all sent letters to WMUR urging management to negotiate with the union before the debate, a call echoed this week by Wasserman Schultz, who was been in contact with station’s management. Tensions had been rising and unfounded rumors swirled that Sanders would boycott the debate in solidarity with the union, while others worried about being forced to decide whether or not to cross a picket line. But when it became clear the sides would not meet before the debate (a WMUR source said the union had previously agreed to sit down afterward), the DNC pulled the plug on the station’s involvement. The debate will proceed as scheduled, and the main sponsor remains ABC News, along with the New Hampshire Union Leader and St. Anselm College. WMUR’s reporters will not be involved in questioning the candidates and it will lose its branding on the event. “We won’t comment on our negotiations with the union other than that they’re ongoing,” Jeff Bartlett, the station’s president general manager said in a statement. The union sought use to the debate as leverage for their pension issue, successfully rallying the candidates to their cause. The campaign of underdog O’Malley, meanwhile, saw its own opportunity to try to drive a wedge between the union and all Hearst-owned stations. O’Malley does not have enough money to buy advertising himself. The removal of WMUR from the debate will satisfy the union, according to Fletcher Fischer, IBEW Local 1228’s business manager. “If WMUR is not part of it, then we have no problem. We want to get to the bargaining table with them,” he told MSNBC.